Can I make a custom Amish quilt from my mother's dresses is an often inquiry we receive at the Amish Quilter. The answer is yes, if you have enough material for the desired effect and coverage you are looking for. 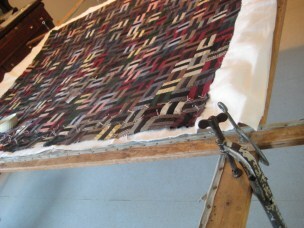 The material will only have to be sufficient for it to be placed on the top of the quilt. The larger the Amish quilt you desire, the greater amount of material will be needed. Just so you will know, the material type itself in not what is important, only that the fabric can be sewn. For this reason, lace and other see through material might not be used. If it is used, then a backing on it should be incorporated into those sections so the matting is not visible. The more delicate the material is, the less use it can withstand. For this, we suggest you only choose material that is from the main portion of the dresses you desire to be incorporated into the Amish custom made quilt. The number of squares that are used on average will be 9 or more. 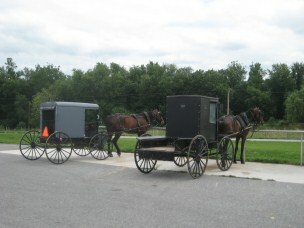 This translates that about 9 different dress materials can be incorporated into your Amish quilt. This does not mean you have to supply tons of dresses, just keep in mind the amount - more is better. If you have 5 or 10 dresses, a great looking custom made quilt can be created to give you the desired effect. It is suggested that the number of dresses be limited to the ones that bring back the most memories. This makes this type of quilt a custom Amish memory quilt for your Mother or for memories of your Mother. This is why the selection of the dresses is so important. As another suggestion, take the dresses for the quilt from the selection that will make you think of her. Many mothers have specific articles of clothing for tasks they must complete. This is another thing you need to consider when selecting the dresses. If you use the one she always wore while cleaning the house, the memories for her will be of work and sweating. You should choose the dress that she wore on vacation on those special nights. A good way to know just what dresses might bring back special a memory is to look at the photo album. There will you find the dresses she wore on specific occasions. This will make it easier for you to decide on just what dresses will be made into the Amish quilt. Above all other things, ask yourself if you will be happy with the dresses you have decided on. Remember, to make them into a quilt they will have to be cut up. For this reason, we can return them but there will be patches missing from them and they will never be dresses again. Making a custom made Amish quilt from your mother’s dresses is a great family heirloom.